Everyone has a favorite recipe. 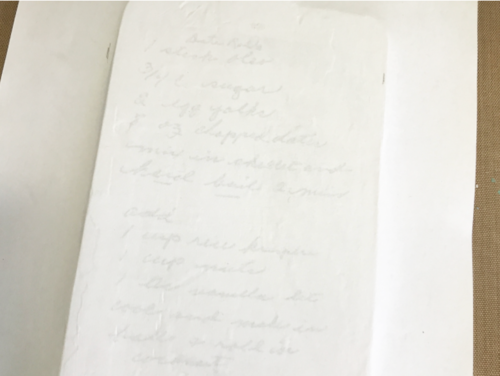 Often these recipes have sentimental value. This DIY project by Lori Craig is a simple way to transfer a cherished recipe onto a cutting board. Makes for a great gift and keepsake. For my recipe I decided to use my cousin’s favorite candy treat that our grandma made for us every Christmas. When my cousin asked for a copy, I was happy to oblige with a small decor piece in grandma’s own handwriting. I picked up an inexpensive plain cutting board from a local craft store. The size is 11” x 6”. Knowing that I’m going to work with Tommy Art Transfer Gel, I wanted a light paint background. Using a small chip brush, apply paint to cover the surface of cutting board in long, even strokes. Don’t forget the edges and back. Shown is Tommy Art White Mineral Paint. Since the white paint has no color pigment, it’s one of the few Tommy Art colors that may require two-coats for desired coverage. 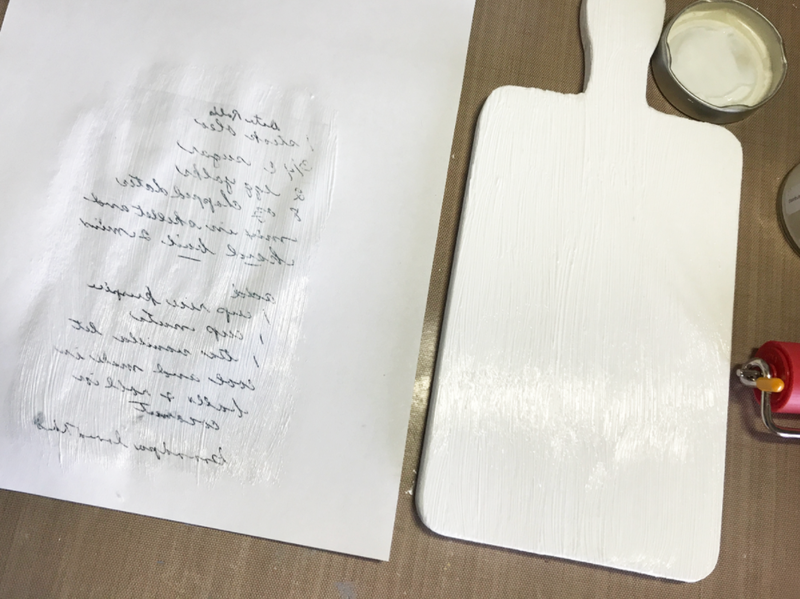 As the paint dries, use a phone photo of a favorite family recipe, bring it into Photoshop to lighten up the background and increase the contrast for crisp letters, and size appropriately for cutting board top. VERY IMPORTANT: FLIP the text 180 degrees before printing so that the word, photo or artwork prints backwards. It will “flip” back to read correctly with the Transfer Gel. TIP: When working with Transfer Gel, it is not uncommon to have a very faint line where paper edges start and stop on finished transfer pieces. With a small, clean chip brush, apply Transfer Gel to the top coat of the cutting board and the printed areas of the copy paper. Similar to “booking” wet wallpaper, Transfer Gel should lightly cover all of the surface area where print applies. Turn the printed work over and center on the cutting board. There will be air bubbles between the paper and the cutting board. The goal will be to press out and eliminate as many of the air bubbles as possible. A brayer is very helpful for this step. Work from the center and “roll” the air bubbles to the edges. 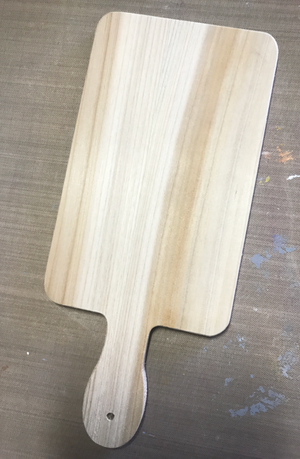 Once air bubbles have been pressed to the edges, the cutting board needs to dry completely - two hours. This one was turned upside down on the flat work surface with a heavy box set on top. When cutting board is dry, gently tear excess paper from edges. Using fingers and a bowl of water, start dripping water over surface of transferred image and gently rub to loosen paper. Paper will start to pill from the wooden board, exposing the transferred image beneath. Be gentle, and rub the paper away in a circular motion with fingertips or sponge. It’s going to be messy. The underneath image will become brighter as the wet paper disintegrates. Gently wipe peeled paper with a dry cloth or sponge. Allow to dry for two hours. Some clouding may occur as the image dries. If the image is not clearly visible, re-wet and remove as much of the backing paper as possible without damaging the image. Protect transfer image with neutral wax, or a coating of transfer gel. If using wax, remove excess wax and buff with a cotton cloth. Optional: For an antique look, apply a small amount of antiquing wax to the edges and corners.